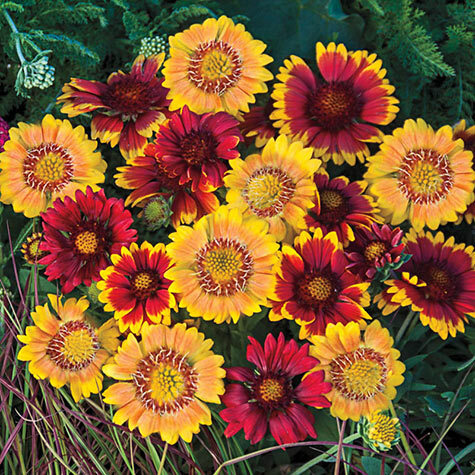 Arizona Sun Gaillardia Mix | Gurney's Seed & Nursery Co.
A colorful, easy-care favorite for front borders and floral arrangements. Mix of rich reds and golden yellows bloom from early to late summer. Low maintenance as well as heat and drought tolerant. Grow 12- to 15-in. tall in full sun. Attract butterflies. 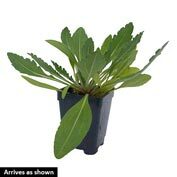 Depth: Plant at the same level as in the pot. Color: Mix of reddish, Mahogany red, rich apricot centers with golden-yellow tips. Foliage: Lance-shaped, hairy, grayish green leaves. Flower Form: Pinwheel blooms with multiple petals. 3 inch blooms. 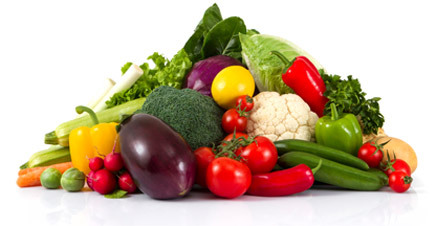 Soil Requirements: Fertile, well-drained soil, but can tolerate poor soils. Pruning: Deadhead plants to encourage more flowering. Cut back clumps to 6 inches in late summer to increase winter survival. Divide plants every 2-3 years in spring or early fall. 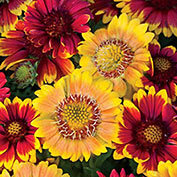 Comments: Extremely heat and drought tolerant, Gaillardia is a great easy-care plant for flower beds. Attracts butterflies.